I bought 2 x Angel raffle, but instead to get raffle I got tickets. 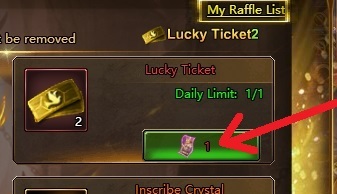 It clearly say- You buy raffle! Why I got tickets? And since this isn't what it say, when you buying, I ask for refund or to get angel raffle! Ty for resolving this. 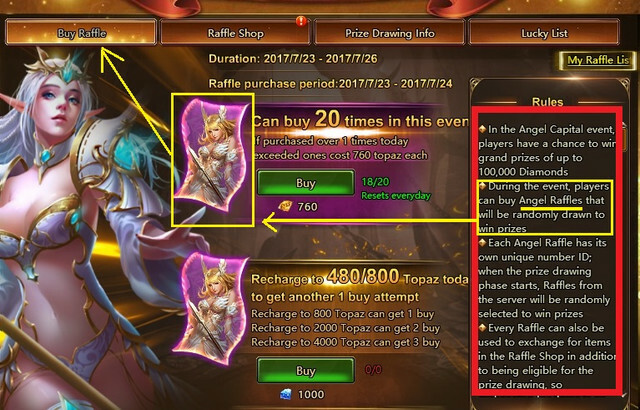 Description is completely misleading, since you should get Angel raffle item, that you can save, not lucky tickets ( it doesn't say you will get lucky tickets, if you buy raffle.) And sorry, for me this isn't small thing. Just to show clearly misleading event description. This is Angel Raffle ticket and it looks like lilac sort of ticket. On Buy raffle page that ticket is shown and described to buy. And all we get is lucky ticket, wich looks, is named and have differend use in event. Last edited by jasmina.firedi; 07-23-2017, 03:09 AM. If I was aware of this problem, I wouldn't spent money on wrong items. Will anyone answer? Last edited by jasmina.firedi; 07-23-2017, 05:20 PM. Hi, we have reported and will confirm with the devs. Hi, we have confirmed with the devs and there is no bug in the purchase as when you prompted to purchase the items it clearly shows that its lucky ticket your buying the error was on the text description on the event rules that says angel raffle but should be lucky ticket. While on the raffle shop players who still have angel raffle from previous events are still given chance to exchange it to lucky ticket and exchange it for items on the shop but they are not gonna be part of the prize drawing for this events. Then I must apologize for my complains, I wasn't right. All times are GMT-5. This page was generated at 09:10 PM.